You can find all the information you need to enjoy all the features of pitchouColor. You will enjoy ! It all starts here ! Homepage: your toolbox to bust you ! You will find on this page the different types of coloring that are proposed to you. Choose 1 and you can draw whatever comes into your head and then show your masterpieces to your friends and parents. When you tap on 2 you will recover all the designs that you have created and saved. You see all the signs as the number 4 ? 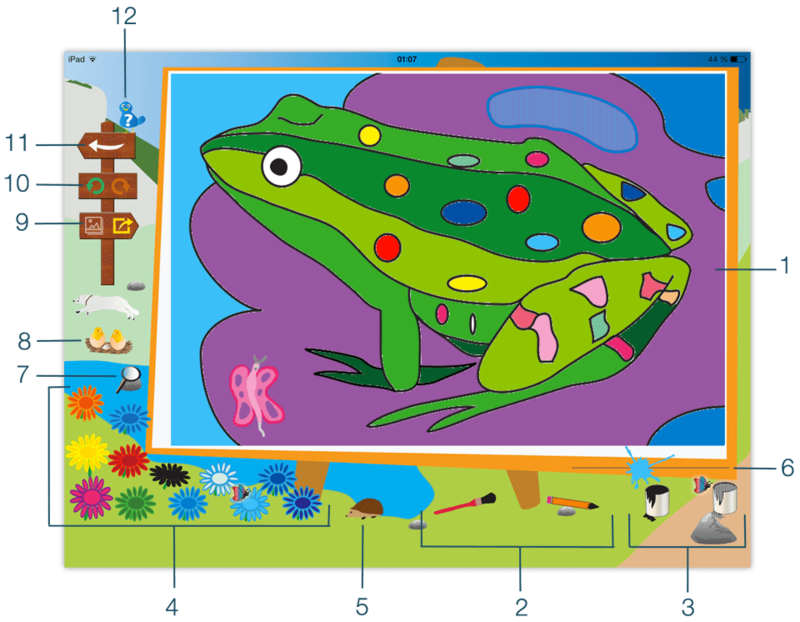 Click on it and you can choose lots of fun coloring ! You can even learn how to write the alphabet, numbers and counting. If you get stuck, or you do not know what to do, based on the little bird 5 and he will help you ! Please do not hesitate to tap on all the items you see on the screen as big dog 6 ! They will reserve many surprises to you ! And I forgot to leave before you have fun ! If your parents or you want to ask us questions or learn more about us, based on our logo 7 ! Here is the gallery of coloring ! You remember, I'd say that if you clicked on certain signs you could choose full coloring. Well this is where it happens ! Choose the design that you like and have fun ! And then come back here if you want to try again. Some coloring you can see a small padlock. If you press it you can unlock all the drawings of the application and enjoy you as much as you want ! But BE CAREFUL ! You have to pay to get them, then you should ask your mom or dad to do with you. If you want to return to the home page to choose other coloring pages, just as you click on the white arrow you see on the left column of your screen. And now your masterpiece ! It is in this area that you'll be able to reveal all your artistic talents ! Draw whatever comes into your head and filled the coloring on the part 1. The two tools that you see in 2 allow you, use a brush to make broad strokes, or pencil to be more precise. In 3 you're going to use the paint pots for easy color fill certain areas of your coloring. With the pot right you can even form raillures as on within the form you see on top of the frog ! All the pretty flowers you see 4 you are used to select the color that you'll draw. If you're wrong on your drawing or your coloring you'll be able to erase your mistakes with this little hedgehog in number 5 ! Moving the small task of painting you see in 6 along the rule you'll be able to change the thickness of your pencil or your brush. In 7 the magnifying glass allows you to zoom in on your work or rotate. Little chicks in 8 used to cut the key sound or not. You can use the icons sharing in 9 to save your drawing, print or share with your friends ! Attention to this last feature should your parents give permission via the parental control panel that we will see afterwards. With two small arrows 10 you'll be able to go back if you make a mistake or you want to modify elements of your masterpiece. If you press the arrow in 11 you can go back to the gallery to select other coloring. 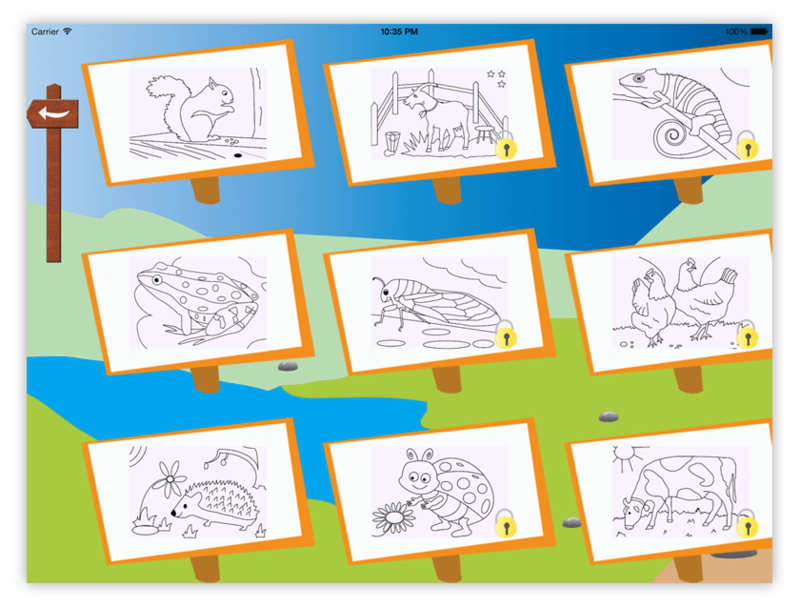 Finally, as the home page, the bird in 12 displays a help window which enables you to use all the elements at your disposal to draw. You are now ready to create beautiful masterpiece ! And for parents to protect their children : parental control ! 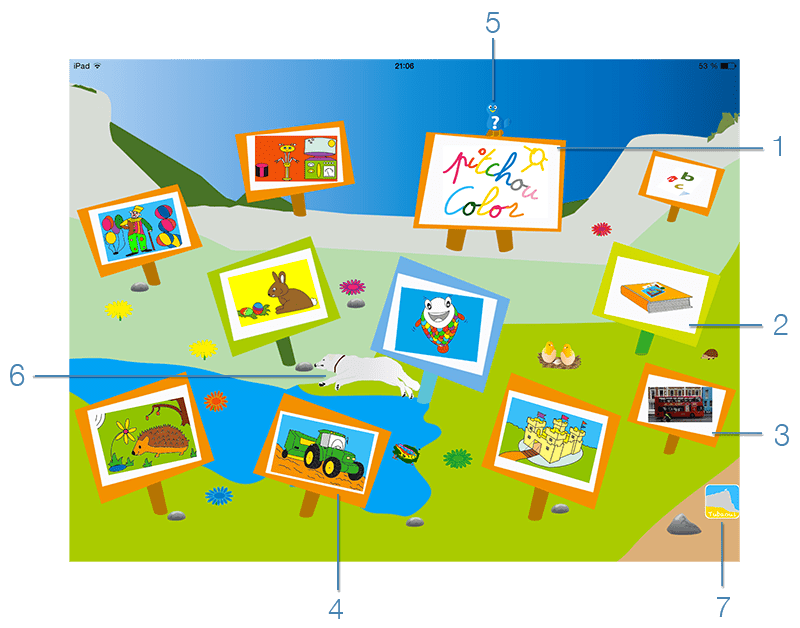 If your child wishes to acquire benefit of drawings or share his works with his friends, he will need to ask your permission in order to pass the Parental Controls panel. Parental control panel asks you to solve a mathematical operation out of reach of younger (do not worry, a bachelor of science is not necessary to resolve the contribution ;-)). Once resolved calculation, the purchase of new designs or sharing is allowed. Otherwise, the action is permitted. Children and parents, you are ready to have fun !